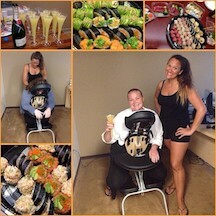 Last week I provided corporate massage for Equis Staffing in Calabasas. It was a surprise and the employees were so thankful and happy! There are so many benefits of having a massage in a corporate environment. I set up a portable massage chair in a conference room or any other unused office space at your location. This ensures for privacy and makes you feel comfortable while getting a massage at work.